What's in the Menu Bar? When you start up your computer, an application called the “Finder” opens, and the desktop appears. The desktop takes up most of the area of your screen, and it’s the area where you’ll do most of your work. 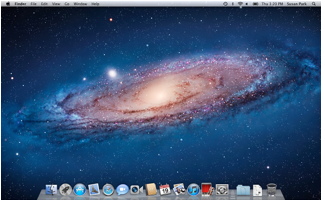 You’ll see a menu bar along the top of the screen, and the Dock at the bottom. Keep reading to learn more about the desktop. At the top of your screen is the menu bar. The leftmost menu is the Apple menu, designated by an Apple icon. 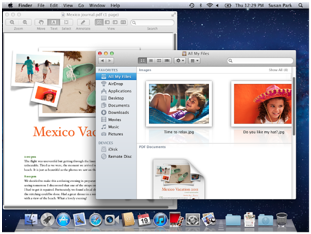 When you are in the Finder, you’ll see the Finder menu next to the Apple menu. When you use other applications, their menus may appear here instead. You can click the desktop at any time to get back to the Finder and see the Finder menu. What’s in the menu bar? By default, the Dock is at the bottom of the screen. You can move the Dock to either side of the screen, and customize it in other ways. The Dock contains icons for applications, such as Mail, that you may use frequently. To open an application, click its icon. To see the organization of the folders and files on your computer, click the Finder icon (smiling face) in the Dock. For quick access to all your applications, including ones that aren’t in the Dock, click the Launchpad icon (next to the Finder icon). The desktop is your work space. Most of the work you do on the desktop is in Finder windows, or in windows for applications you use, such as Mail or the Safari web browser. Many applications also have a full-screen view that lets you expand the current window to use the entire screen. You can organize and customize windows and the desktop to create a comfortable working environment.